We conducted significant research studies to understand the effects of the Institute’s Mindful Leadership Training. I. We undertook training of 123 General Mills directors and managers using our seven week “Mindful Leadership and Wellness©” curriculum. General Mills conducted research on the effectiveness of this training. Participants were asked to answer a 19 question survey before the course and again after the course. The results of the training are summarized below. The 19 questions can be seen here. The Harvard Service-Profit Chain identified employee engagement as critical to organizational excellence. 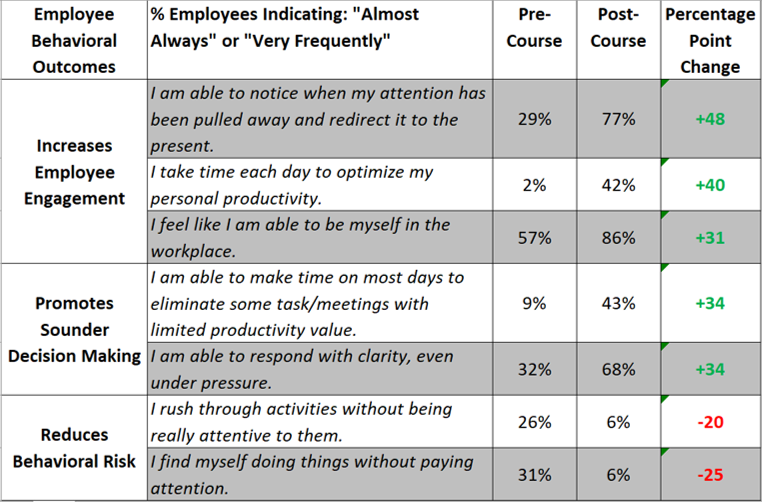 The chart below, developed by The Rutgers Business School, shows the connection between the Institute’s curricula and employee behavior. • Nearly 70% reported that the training made a positive difference in their ability to think strategically. III. In 2011, the Institute for Mindful Leadership and the Harbin Clinic partnered to study the effects of mindful leadership training on error reduction in an Institutional Review Board (IRB) Study on the Effect of Mindfulness Training in Radiation Oncology Practice Study. This training combined a full day of training at the Harbin Clinic with four, online continuation sessions. Error prevention in radiation oncology became a significant issue after patient morbidity and death from mistakes in radiation delivery was reported in the lay press in 2010. The study showed definitive conclusions showing that increased mindfulness improved the patient safety culture. IV. In 2014 and 2015, we partnered with the University of Massachusetts in a yearlong study that included two different groups of Massachusetts physicians. The Institute provided its Mindful Physician Leader curricula which was followed up by peer led monthly groups to support the development of mindful leadership practices and to share organizational and leadership applications. V. Since 2011, the Institute has partnered with a large health care organization in Canada, The Catholic Health Corporation of Manitoba, to bring mindful leadership training to its executives, health care professionals and managers. The organization has been doing research on the effects of the training on leadership development, engagement, creativity and compassion. The preliminary results are favorable, especially in showing that mindful leadership training augments mindfulness, compassion and well-being.